A 2.5-inch reinforced border around the mattress edge so you can use the full surface of the mattress, as well as providing a solid seating surface. Durable knit fabric with spun yarns and moisture-wicking treatment for a soft and comfortable feel next to your body. Side panels use a breathable border fabric that allows more airflow to help keep you more comfortable during the night. Advanced version of our specially engineered encased coil system for more precise support. A more dense arrangement with nearly 20% more coils throughout responds to the natural curves and alignment of your spine, for full-body support. Encasing allows each coil to move independently, for more targeted support and reduced motion transfer. 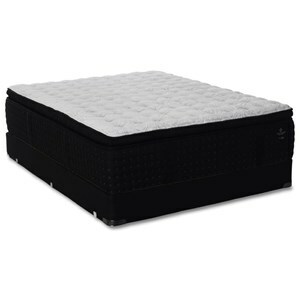 The Posturepedic Plus B2 Twin Plush TT Mattress and Ease™ Adjustable Foundation by Sealy at Beck's Furniture in the Sacramento, Rancho Cordova, Roseville, California area. Product availability may vary. Contact us for the most current availability on this product. Sealy Posturepedic® Mattresses are known for their comfort and all-over support so your body can fully relax and you can get the sleep you need. This collection features the support of the Sealy Embrace™ Coil: Specially engineered encased coil system that responds to the natural curves and alignment of your spine, for full-body support. Encasing allows each coil to move independently, for more targeted support and reduced motion transfer. These coils are surrounded with a SolidEdge HD System which is a reinforced border around the mattress edge so you can use the full surface of the mattress, as well as providing a solid seating surface. In addition to layers of SealyCushion™ Soft foam, these beds also have a layer of SealyCool™ Gel Memory Foam providing you a cool and pressure relieving Sleep. The Posturepedic Plus B2 collection is a great option if you are looking for Mattresses in the Sacramento, Rancho Cordova, Roseville, California area. Browse other items in the Posturepedic Plus B2 collection from Beck's Furniture in the Sacramento, Rancho Cordova, Roseville, California area.